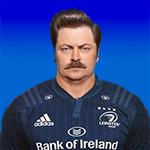 babbling brook, the leinsterfans.com supporters forum • View topic - Ireland v England. Saturday, February 2nd. Ireland v England. Saturday, February 2nd. Re: Ireland v England. Saturday, February 2nd. Peter O'Reilly on The Times Rugby Podcast - The Ruck referenced how another journalist turned towards him before kick-off and commented on the lack of passion in the way the Irish anthems were sung and the mood of the crowd was down. BBC Podcast - Ugo Monye went long on how he expected a cauldron-like atmosphere but was surprised at how the crowd was flat and the mood around Dublin was way too ccky to the point that he was pissed off come kick off. Brian Moore on the Telegraph podcast also put emphasis on how lacking the crowd were. James Downey referenced the crowd separately. It doesn't win you matches and it is hard to change and the IRFU do their best to create an atmosphere (which is part of the problem). The atmosphere was very different when there were terraces, there is no disputing that. Different gravy. Forget the corporate red herring, they are prawn-sandwiched in premium. We are a pampered lot across all parts of the stadium. Thats partly being spoilt after 2018, partly terraces, partly fewer people who play/ever played the game as an adult, partly just where society is as a rich country compared to the era up to the 90s/pre-Celtic Tiger. Only a percentage of what could be called corporate tickets are in the premium levels. The majority are in the regular seats - both through sponsor tickets and tickets bought by corporate and travel package organisers from other sources. ronk wrote: I was in Twickenham in 2004 for the first game there after England won the RWC. Everyone expected them to win, it doesn't work that way. We wanted it more. We've done this often enough, especially to England, that we should recognize immediately what happened. They had a big game in them and we were undercooked. We got them fired up and angry while too many Irish eyes were on the slam. My eyes weren't on a slam. drop goal in paris and stockdale intercept in dublin v wales when wales looked like they would pinch it out wide - not exactly a resounding GS sweep...despite the quality of our performance in twickers to win the GS. Championship maybe but I think most irish rugby fans would have been looking at a top 2 in the championship. At least I was. Agree completely about them being fired up. Not often you see England doing a lap of honour like that after a game against Ireland. It was a MASSIVE win for them and that showed how much it meant to them. I was reminded of what happened in croke park in 2007...the boot was on the other foot back then but we completely bossed an English team that got to the WC final that year. As an aside..the sexton intercept reminded me of boss at the end of that game. We bossed them in twickers last year as well...but it was more a professional, well executed win rather than an emotionally "fired up" win like in 2007. Looking forward....this is shaping up to be a sizzling 6N. Wales V England should be an humdinger. I fancy/hope France next sunday to sneak a win against England. If they manage to do that and deny England a LBP our last game in cardiff might not be just about pride.